What are near field monitors? Near field monitoring is describing the optimum response area between speaker and listener. They are the speakers nearest to you. These are important monitors and the way you place them is just as important. They should be no more than 3 to 5 feet away from you. 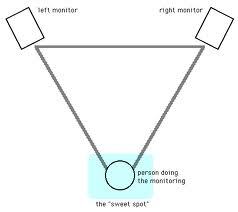 You and the monitors should form a triangle with you being the tip. Say you place the speakers 5 feet apart, then there has to be 5 feet from each speaker to your ears. Angle the studio monitors directly towards the listener. It looks like a triangle if looking from above. This set up is how most mixing should be done. This is how you can listen in the full spectrum of stereo sound.